This January, Professor Julian Dowdeswell of the Scott Polar Research Institute will lead an international research team in the long planned expedition to the Weddell Sea. This expedition aims to investigate ice shelves around the Weddell Sea, particularly the Larsen C Ice Shelf. It also hopes to locate the wreck of Shackleton’s ship Endurance, which sank in the area in 1915. The expedition’s progress and achievements will be followed internationally – in addition the Royal Geographical Society has created an educational programme aimed at engaging the interest of children from primary level upwards. An important aim will be to investigate the shapes of the ice shelf bases. Ice shelves stop ice from flowing outwards from the continent. Thinning of the ice shelves results in increased flow from the interior, which, in turn, causes a rising global sea level. The sea floor will be examined to assess the stability of the ice shelf. Although the general circulation of oceans is determined by wind driven currents, the Weddell is one of few locations where deep and bottom water masses contribute to global thermohaline circulation. Bottom water is the lowest water mass with distinct characteristics in terms of physics, chemistry, and ecology and a temperature of -0.7 °C or colder. The thermohaline circulation is the motor of deep ocean currents and is driven by density gradients influenced by surface heat and freshwater fluxes. The description relates to thermo- temperature-and –haline, salt content. The Larsen Ice Shelf, in the northwest part of the Weddell Sea, is named after Captain Carl Anton Larsen, master of a Norwegian whaling vessel who sailed along the ice front as far as 68°10′ S. in 1893. From north to south segments of the shelf are called Larsen A, B, and C (the largest), and Larsen D, E, F and G.
The 2019 expedition is focused on the Larsen C ice shelf from which a giant ice berg calved off in July 2017 (twice the area of Luxembourg), reducing the size of the iceshelf by approximately12%. Dowdeswell and Shears[ii] explain in the ‘Geographical’ that measurements will be taken of salinity and temperature of the sea adjacent to the shelves, samples of marine life will be obtained and the sea ice thickness will be measured by aerial drones. Autonomous Underwater Vehicles will make echo soundings of the underwater shape of the ice shelf base, the roughness of which is a vital parameter in numerical modelling of future ice shelf stability. Ernest Shackleton’s Ship will be searched for. Whether the team will be able to achieve these aims is uncertain — the conditions are so unpredictable that attempts to navigate south could be unsuccessful, but this expedition is of pivotal importance in attempting to obtain long-term prognostic information relating to global warming. I hope this important analysis of the Weddell Sea will be successfully accomplished. I was interested to see that the Albert Medal and the Polar Medal, awarded to Victor Hayward, are to be auctioned. It is anticipated that thousands of pounds will be realized. I am delighted that there is still such interest in the expeditions of the Heroic Age. The Albert Medal was awarded for the saving of life on land or sea (two medals with different inscriptions depicting the two groups). The medal was discontinued in 1971 and replaced by The George Medal. The land version, which was awarded posthumously to Victor, was in red with a red and white ribbon. given service of outstanding quality in support of acquisition of this knowledge and who, in either case, have undergone the hazards and rigours imposed by the Polar environment. It is greatly valued. William Speirs Bruce, whose biography I have just completed, battled unsuccessfully for years to get the medal awarded to members of his Scotia Expedition The medal is octagonal, with a white ribbon. It depicts a ship surrounded by ice floes. 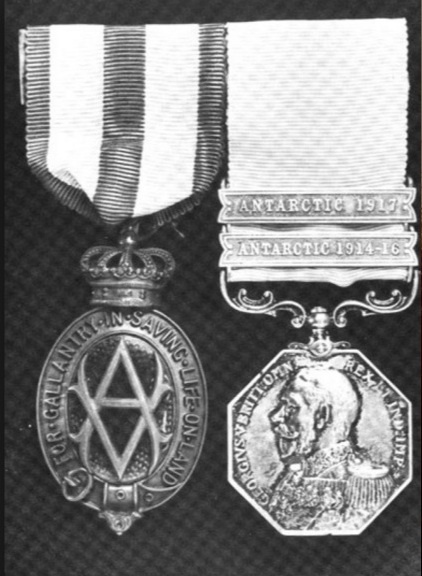 The obverse has a portrait of the reigning monarch, in Victor’s case George V.
Shackleton’s support team went to McMurdo Sound. Their story has been overshadowed by the Endurance saga. The Captain of the Aurora was Aeneas Mackintosh. 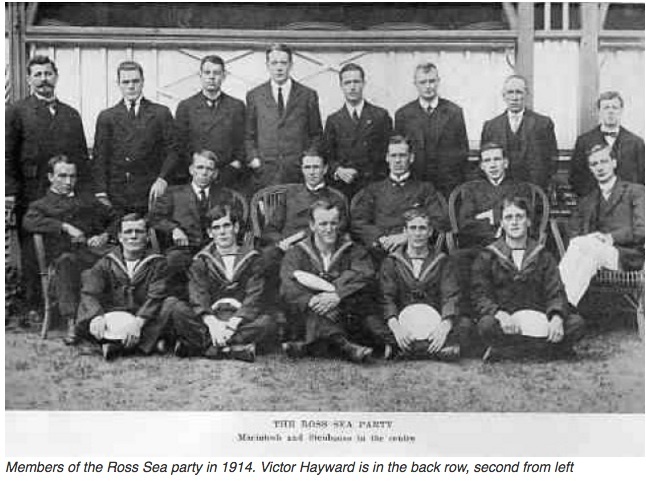 Victor Haywood was a member of the Ross Sea party, which included the Reverend Arnold Patrick Spencer Smith and seven other members. Mackintosh was in charge of laying a series of depots across the Great Ice Barrier from the Ross Sea to the Beardmore Glacier for Shackleton to pick up when he had crossed the Antarctic from the Weddell Sea. Shackleton’s party could not carry sufficient food and fluid for the entire journey and depended on these depots for the final quarter of their journey (as is well known, in the event, Shackleton did not actually make landfall on the Antarctic as ‘The Endurance ‘became icebound, and drifted around the Weddell Sea from February 1915 to November 1915, when she sank. Mackintosh sailed to Antarctica from Tasmania. On arrival in Antarctica three camps were prepared, the largest in Cape Evans, Scott’s hut of 1910, the second in Hut Point Scott’s original camp of 1902 (relatively poorly equipped and separated by sea/ice from Cape Evans by thirteen miles), and thirdly at Safety Camp, a staging area from which the parties would set out for the south. Mackintosh followed instructions with enormous difficulty. The first party, January to March 1915, reached 80 degrees S. At each parallel they left depots, made out of ice blocks to about 12 feet and topped by a high black flag. By the time they returned to Hut Point they had lost all of the ten dogs they had taken. In May 1915 the Aurora was torn from her moorings in a gale and carried out to sea. The men at the base were marooned. Mackintosh and his party spent the winter preparing to set up more depots in the south. The second depot laying party worked from September 1915 in three teams of three. A failure of a primus stove meant that three of the party returned to Cape Evans leaving six to sledge south. During the journey the Reverend Spencer-Smith failed rapidly and became so debilitated with scurvy that he had to be left behind in a tent whilst the others progressed south, passing the 83 parallel (where Shackleton had turned back from his ‘Furthest South’ in 1909). They finally got to the base of the Beardmore Glacier leaving a depot with two weeks supply of food and fuel. On their return the party picked up Spencer Smith. When Spencer-Smith was alone and dying slowly in his tent, he hallucinated and wrote notes that are touching to read – he thought that the war was over, that Sir Ernest and Frank Wild had appeared, both clean and neat, and that he had spent the day delivering a sermon in execrable French. He was conscious enough to write ‘Laus Deo’, as the team approached his tent. The return journey was terrible. Both Mackintosh and Spencer-Smith had to be pulled on a sledge and Victor Hayward was also very weak, but he looked after his two ill companions putting their wellbeing above his own and it was for this service that he was to be awarded the Albert Medal. As the awful return continued, Mackintosh was left behind behind as Victor and Spencer-Smith were taken north by sledge. Spencer-Smith died, worn out by exhaustion and scurvy. On the return there was no conversation ‘all our energies are needed for the job in hand’ -to bring the party to the relative safety of the Hut Point shelter where Victor recovered slowly. Mackintosh was able to follow later. The party reached the Hut Point camp in mid March. Here they were marooned waiting for the ice between Hut Point and Cape Evans to be strong enough to stand their weight. They ate seal meat morning, noon, night. They lived ‘like troglodytes’. On May 8th Mackintosh and Victor Hayward decided they had had enough of the conditions and the unending seal meat. They decided to cross the thirteen miles of ice to Camp Evans (warm and well supplied with food in comparison to Hut Point). They left against the advice of their companions, who watched their figures slowly becoming fainter and fainter in the dim light. Two hours later a blizzard swept over the Sound Mackintosh and Hayward were never seen again. They could have fallen through the ice, or been carried out to sea when the ice broke up. If, by any chance they had managed to reach land, they would have succumbed to hypothermia. Seven years later, in 1923, Hayward was posthumously awarded the Albert Medal for gallantry, in recognition of his efforts to save the lives of Mackintosh and Spencer-Smith on the Barrier. The award of the Polar Medal recognized his prolonged support, service and contribution to advances of knowledge in the Antarctic. He was a man who had suffered and endured the hazards and rigours of the continent with courage. Shipworms which destroy wood. do not survive in Antarctic waters. This is because a Front, at the junction of the polar and warmer waters (as well as currents that circulate round the continent), acts as a barrier that blocks the invasion of these destructive mollusks. When a Norwegian study led by Thomas Dahlgreen, (1), left wood on the Antarctic shelf for over a year, the wooden planks remained intact. Trees have not grown on the continent for millions of years and it seems that off shore Antarctica is an inhospitable habitat for wood borers. The fascinating question is whether wrecks in the Weddell Sea could be recovered. The prospect seems remote, given the depth of the Weddell Sea and the pack ice, but nevertheless the suggestion remains a tantalising prospect. When Shackleton’s ‘Endurance’ was crushed by the pack and sunk in November 1915 (She’s going, boys), she was thought to be lost irrevocably. Could she still be lying, crushed but defiant under the Antarctic waters? I love this exhibition. It shows the photographs of Frank Hurley and Herbert Ponting. The images are very different. Hurley’s were made under conditions of great stress when “Endurance” was caught in the ice and then when the crew were drifting on ice floes for well over a year. Ponting was a wonderful professional photographer; Hurley was not, but made a matchless record of the Endurance and her crew. Both created memorable scenes. Ponting’s picture of the “Terra Nova” through the window of an iceberg imprints itself on the memory, whilst Hurley’s photograph of the brilliantly lit Endurance in the black Antarctic winter is an unforgettable image. Ponting did a “mock-up” of the expedition members sitting round a Nansen cooker in a tent before they set off on their ill-fated journey to the South Pole. In this image “Taf” Evans, “Birdie” Bowers, Edward Wilson and Captain Scott smile optimistically at each other.